Syntax Highlighting is a very much useful if you put code on your website. This can be easily achived with django-pygments. over 300 languages are supported. 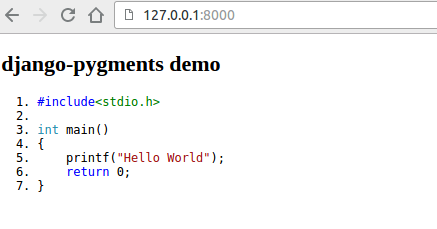 django-pygments is the implementation of the pygments syntax highlighter for django. usage is quite simple. after setting up everything, you need to put necessary template tags and then place your code in pre tags with a lang attribute specifying the language of the source code in your template. 1. First, Install the following packages. 2. add django_pygments in installed apps in settings.py file. and place the generated vs.css file in static/css directory so that you can link it with template. 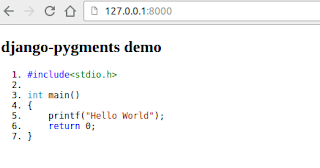 Here is an template example showing a Sample C source code highlighting.